The next couple of weeks might offer the last fleeting opportunity for many of us to enjoy the weather outside before the chill of winter completely sets in. Of course, if you happen to live in a part of the world where winters are barely cold (or maybe down under in Australia), taking the party outdoors is a perfect option, even when Christmas and New Year’s Eve come along. And al fresco dining is the perfect way to spend some beautiful afternoons and evenings outside with friends and family. 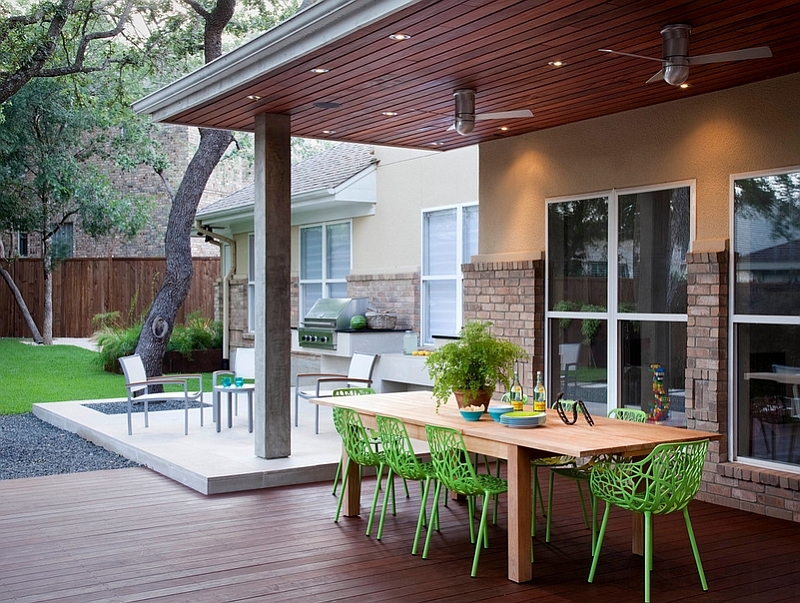 Outdoor dining spaces have an inherent cheerful, festive appeal that draws you in. Allowing you to find a relaxing retreat just outside your living room, dining al fresco turns even the most mundane weekend into some wonderful family time! 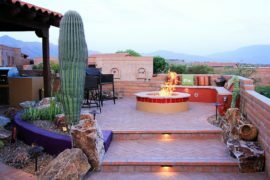 Shaping an outdoor dining space is both easy and fun, and it involves far less effort than you would imagine. 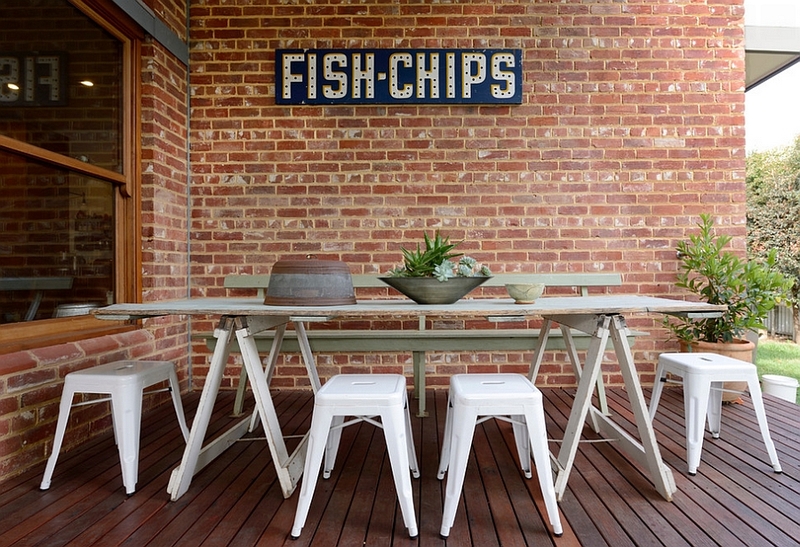 Here are some tips and ideas that will inspire you to take the dining outside with practicality and panache! 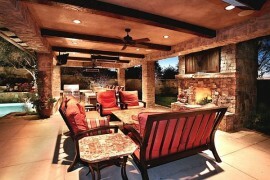 One of the first thoughts that crosses the mind while planning for an outdoor dining area is the space required for it. 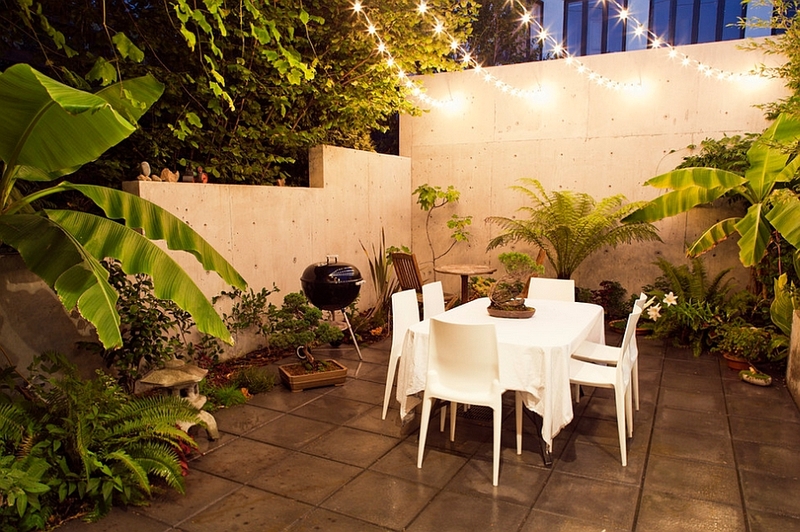 While you might not be blessed with an extravagant backyard complete with a pool and a gorgeous outdoor lounge, there surely is some nook or corner in that small yard for a simple dining area! Be it the front porch or the one in the back, a small, private garden filled with greenery, or a modern balcony in your apartment offering a view of the city skyline, even the tiniest space can be used for al fresco dining. Maybe you can use a round table in the small corner with four chairs to shape a simple outdoor dining area for the family! 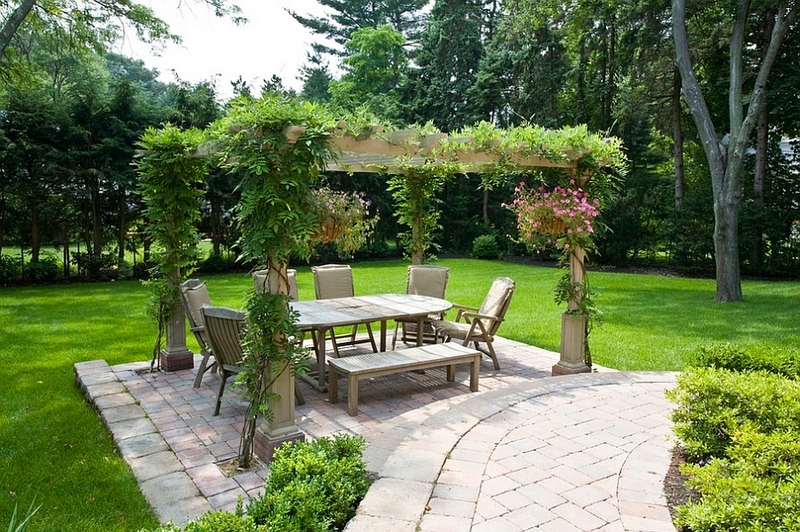 For those with larger backyards, finding the right place for the outdoor dining space involves taking into account the rest of the outdoor landscape and how the dining area interacts with the other elements. 2. 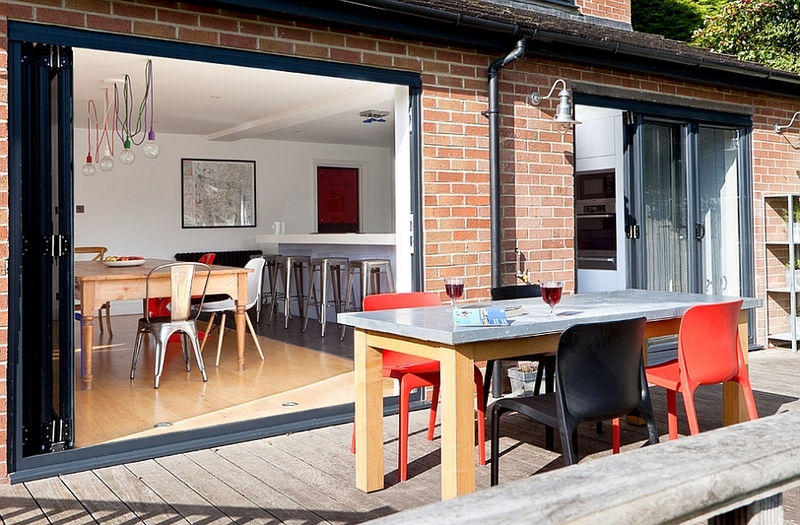 An Extension of your Home? So, should your outdoor dining space seem like a natural extension of the interior or should it have a style and theme of its own? Well, to be perfectly honest, you can go both ways with it. 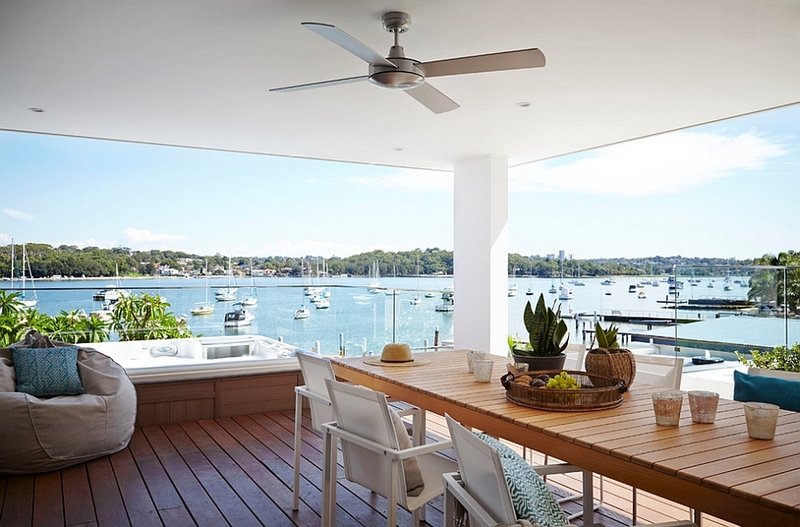 The choice you make depends on how far or near the outdoor dining area is to the house and the ambiance that you are aiming for. If you happen to have a spacious backyard or deck, place the outdoor dining room away from the main house and give it the aura of an exotic retreat. Surrounding it with tropical plants and placing it next to the pool can create the atmosphere of a lovely getaway that has a style of its own! For those using the porch as the spot for outdoor dining, protection from the elements is barely a concern. In other cases, covering the outdoor dining area is a wise choice, as you never know when an unexpected shower could hit you. 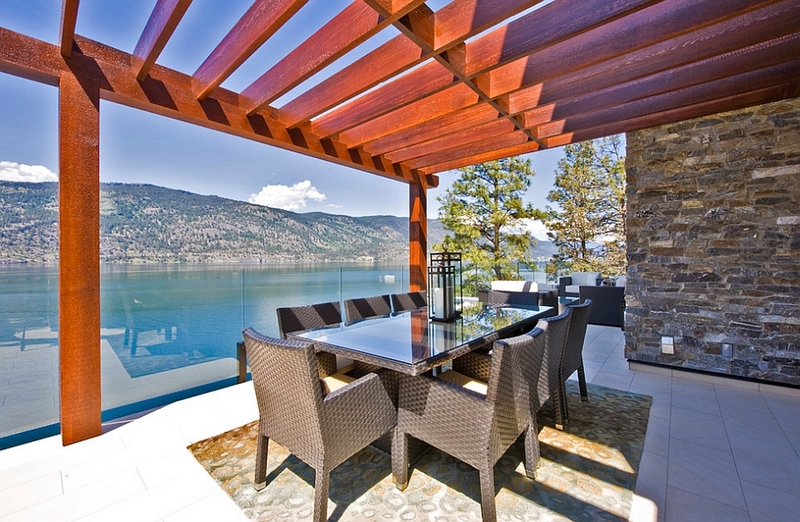 Screened outdoor pergolas allow you to enjoy a lovely dinner outside, even on cold days, while simpler pergola designs coupled with a natural canopy and drapes can also offer ample shade. 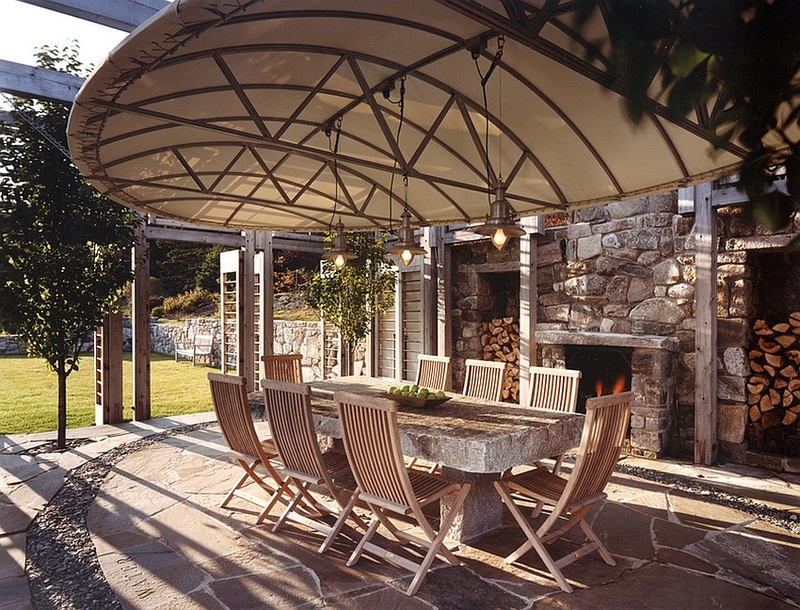 If you prefer more open outdoor dining space designs, then at least keep a couple of umbrellas handy, just in case you need some quick cover. 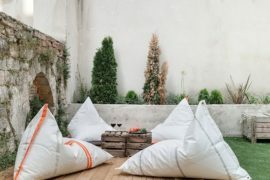 Contemporary outdoor decor has evolved to a point where it is as aesthetically pleasing and comfy as the decor used indoors and offers great durability. Picking a lighter dining table and stackable chairs is a cool option for those who might want to move their dining area outside depending on the season and other space constraints. 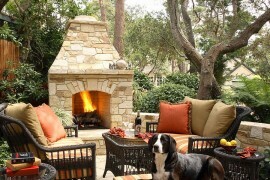 Adding a fireplace next to the outdoor dining area is another great way to give the backyard a classy twist. A fabulous fireplace instantly becomes the focal point of the setting and keeps you warm even on those chilly winter evenings. 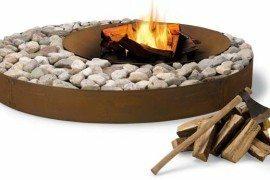 Even a couple of fire pits can transform the ambiance of the space instantly. 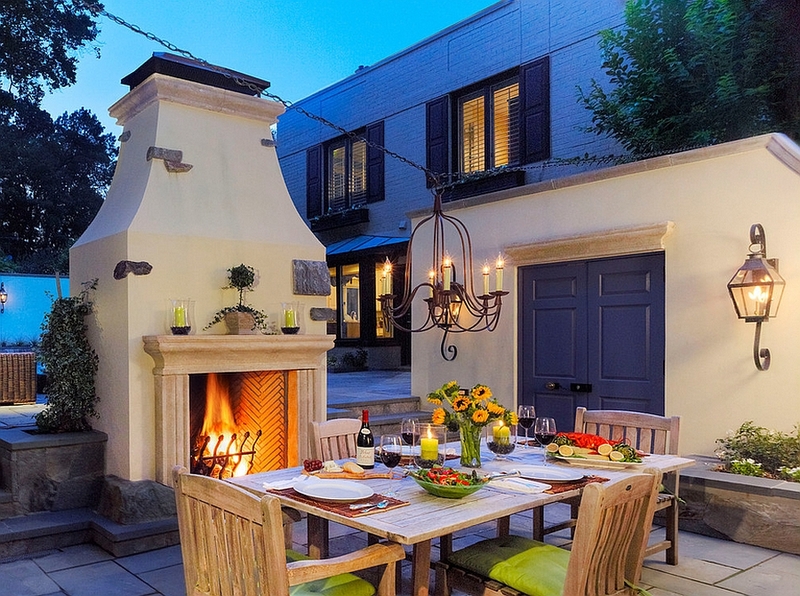 For those big on throwing weekend parties and having friends and family over frequently, an outdoor kitchen is a sensible and practical option. 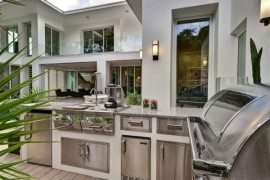 Modern outdoor kitchens come with all the facilities that their indoor counterparts offer, and they complete your al fresco dining experience beautifully. In case you are not keen on a complete outdoor kitchen, adding a barbecue grill to the setting is a wonderful alternative too. 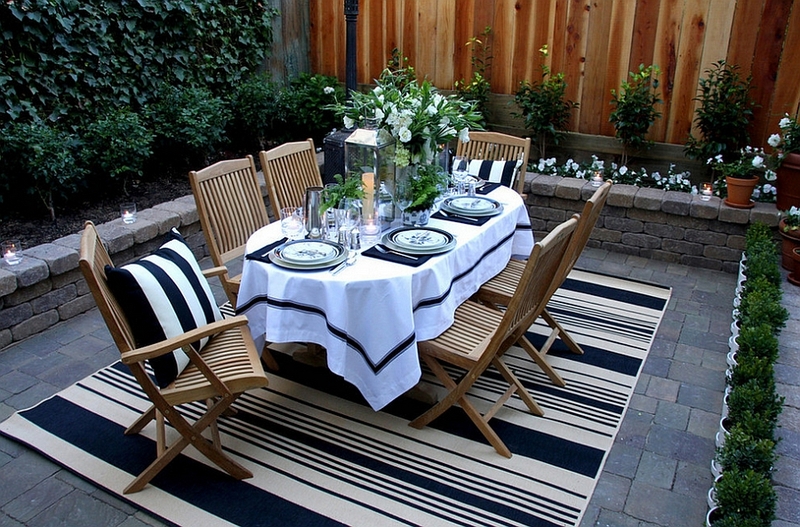 Just use a beautiful area rug to delineate the dining space, and you have a snazzy, party-ready backyard. There is indeed nothing like sitting under the star-studded summer sky and enjoying a lovely dinner as the gentle wind refreshes you after a long, hard day. 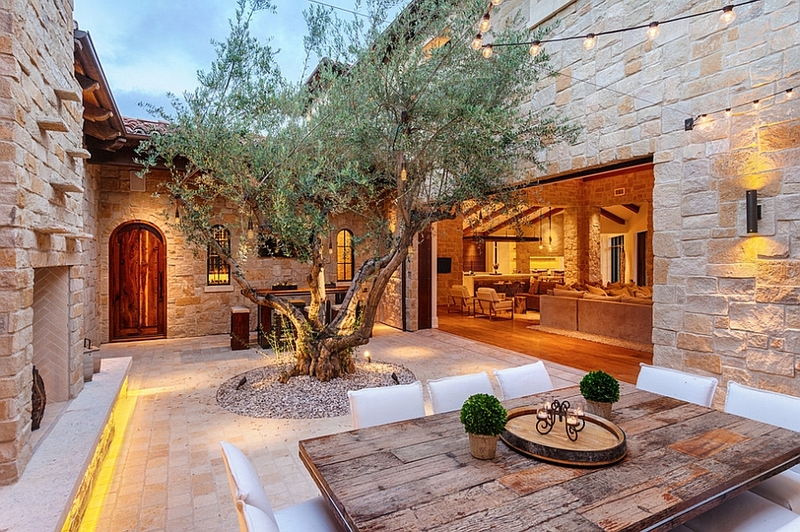 But to get this picture-perfect outdoor dining space, you need the right lighting. Candle lanterns are apt for those trying to go for the informal, chic atmosphere. 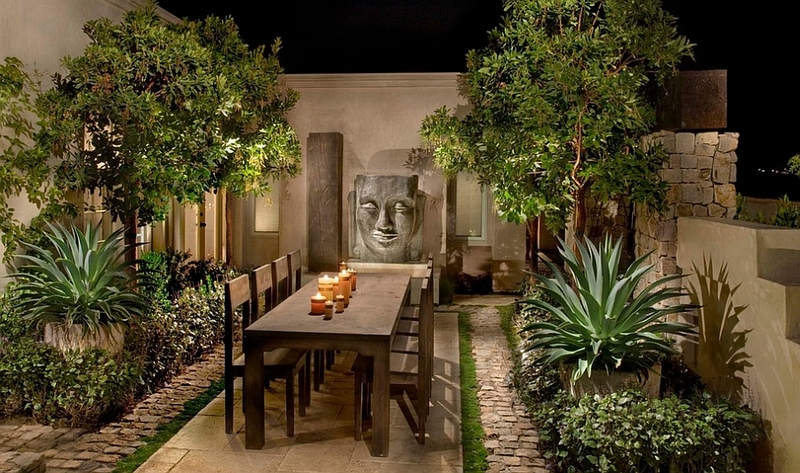 Hanging them elegantly to illuminate the walkway also gives the entire backyard a stunning vibe. 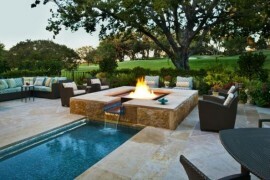 Another out-of-the-box choice is Tiki torches, which steal the show and set the tone for a resort-style backyard. From string lights to chandeliers, the choices here are simply endless. 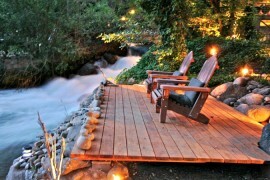 Part of the reason for taking the dining experience outdoors is the unabated views that it often offers. 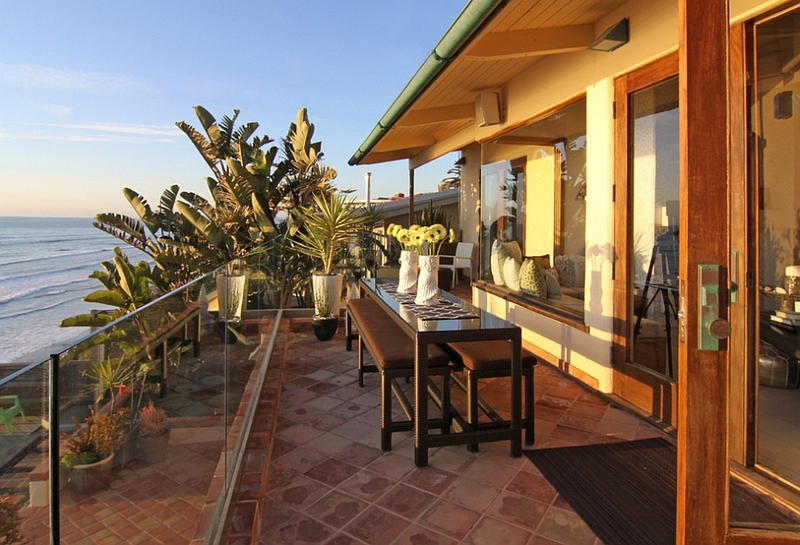 If you have a balcony or backyard that offers the views of distant mountains or a gorgeous beach, make the most of it. Even a sparkling city skyline makes for a magical backdrop when used right! 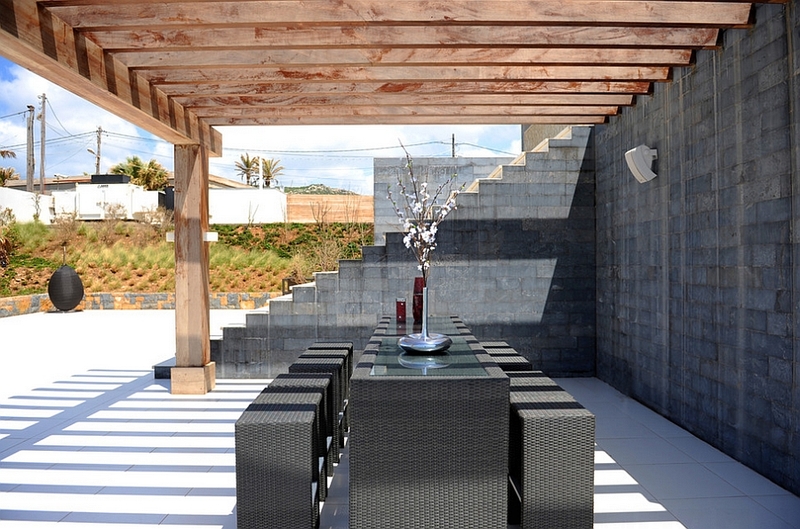 In fact, you can let the backdrop decide the theme of your al fresco dining and the decor that you use.